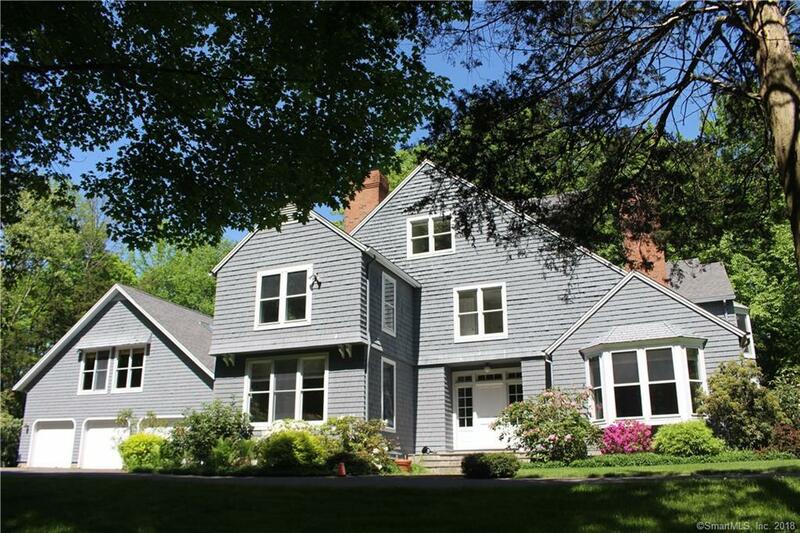 Beautifully and elegantly designed 5-bedroom 5.5 bath colonial. This home in its private 10 plus acre setting is just south of the center of town, close to shopping and restaurants. This home has it all. Warm and inviting large den with its fireplace and wood paneled walls is great for casual entertaining. The living room is great for more formal gatherings with a marble surround fireplace. The Library has built in book shelves and is great for study, reading and games. The kitchen has granite counters and opens into the warm sun-lite dining area. The formal dining room is larger and great for entertaining guests or holiday gatherings. The first floor has a private office that could also be used as a sixth bedroom. Follow the awe inspiring open stair case to the second floor to four of five bedrooms. The master bedroom suit boast a newly redone balcony that overlooks the back yard and woods. Relax in the in the tub in the large open master bath. The large fifth bedroom is on the third floor and with its own bath. Perfect for guests or au pair. Over the garage is a larger bonus room with vaulted wood ceilings and built-in book shelves. A great place for a game room, music room or art gallery.